There are many credit card processing methods, but not all of them are beneficial for your business. Our payment gateway, EBizCharge, offers a SAP B1 application that can help integrate your payments, save time, and significantly reduce processing fees for your business. The SAP B1 application plugs-in to SAP B1 to provide simple payment processing directly within your SAP B1 system. In addition, our EBizCharge payment gateway provides a complimentary customer payment portal, along with secure payment card tokenization to ensure complete protection of sensitive credit card information for each and every transaction. 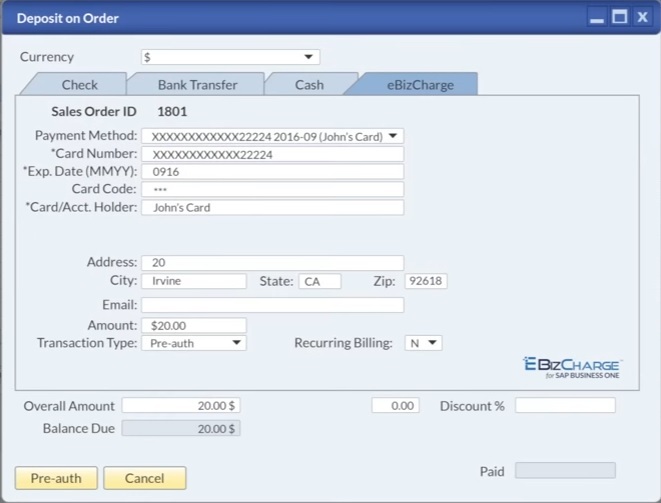 EBizCharge is a feature rich payment gateway that delivers simple payment processing for SAP B1. Our SAP B1 application, powered by EBizCharge, plugs-in to your SAP B1 system, allowing you to process credit cards directly within SAP B1. The SAP B1 application comes equipped with EBizCharge Connect, a complimentary customer payment portal that allows your customers to view outstanding invoice amounts and process payments online. The customer payment portal automatically applies payments back to your SAP B1 application, and customers can print or email a receipt for their records. 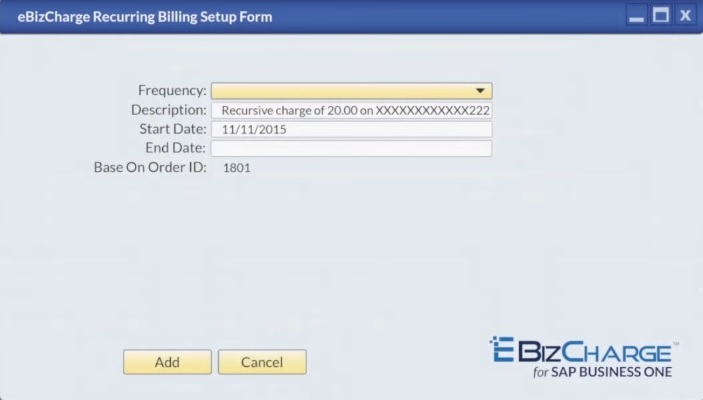 EBizCharge takes line-item detail and invoice information already stored in SAP B1 and sends it to our proprietary payment gateway. 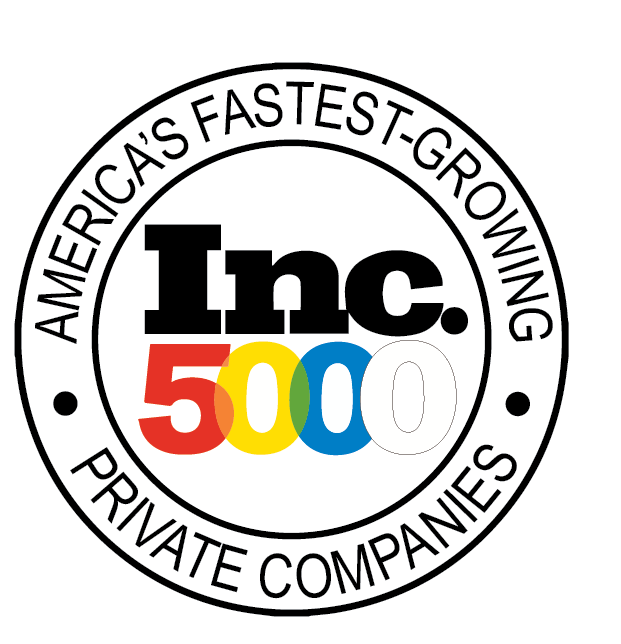 This information is used to qualify your cards at the lowest possible interchange rates and provide the lowest processing fees for your business. The SAP B1 application implements flat rate pricing option to guarantee the lowest merchant fees for your SAP B1 system. Flat rate pricing offers the same low monthly rate for any type of credit card without any additional transaction fees, and makes it easy to see exactly how much you’ll pay in processing fees each month. EBizCharge for SAP B1 uses tokenization and encryption technology to ensure that all your sensitive credit card data is securely protected within your SAP B1 system. In addition, our SAP B1 application is fully PCI compliant to support complete information defense. The payment card tokenization replaces credit card information with a unique token that is only decipherable with our integrated payment system. The original credit card data is no longer used for future transactions. Tokenization makes it impossible to hack or decipher your credit card data. In addition, our SAP B1 application is developed and maintained by in-house software developers to ensure the most advanced, up-to-date integrations available. Our SAP B1 application is built to resemble your current SAP interface for simple and effective usability. The EBizCharge payment gateway provides advanced payment card tokenization to guarantee secure protection of all sensitive credit card information. In addition, our EBizCharge Connect customer payment portal allows your customers to view and pay outstanding invoices online remotely from anywhere. Contact us today for a free demo and receive simple payment processing within SAP B1 now!